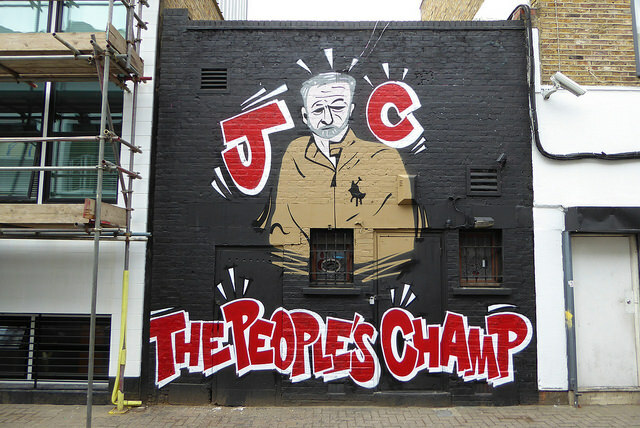 Image: “Jeremy Corbyn graffiti, Camden,” by Duncan C (via Flickr). Whisper it softly, but Britain may have turned the global political tide. To understand the extraordinary political events of the last few days, it’s necessary to grasp a little history. Seven years ago, in the immediate wake of the financial crisis, the electorate rejected the mildly left Labour government (led by Tony Blair and then Gordon Brown) which had been in power since 1997, in favour of a coalition between the Conservatives (who won most seats but not a majority) and the small, socially-progressive Liberal Democratic party, which together implemented a policy of austerity (cutting back public expenditure, particularly welfare) in order to reduce the country’s fiscal deficit. Two years ago, it was expected that another general election would lead to another hung parliament (no party with an overall majority). Running on a moderately left program, Labour performed disappointingly and the Conservatives surprised pundits and pollsters by squeaking in with an absolute majority of 12 seats over all other parties. Able to govern alone, they had no excuse not to deliver on their election promise to hold a referendum on Britain’s membership in the European Union. That referendum was held last summer, and was a seismic shock. Despite being supported by the four traditional major parties (Conservatives, Labour, Liberal Democrats and Scottish Nationals), though opposed by the right-populist UK Independence Party (UKIP), the remain side narrowly lost. People voted to leave the EU for a number of reasons, but the dominant motivation was hostility to unrestricted immigration from other European countries. The older, whiter and poorer you were, the more likely you were to vote to exit. One of the most reliable indicators of a leave voter was support for the restoration of the death penalty. An unexpected victory by old, white, left-behind social conservatives in Britain was, of course, followed by something very similar in the United States. From Poland via central and western Europe to Britain and the United States, it seemed that the populist right was riding a wave of disillusion with liberal globalist values and enthusiasm for socially conservative if not overtly racist policies. Less noticed was the fact that right populists from the Polish Law and Justice Party via the French National Front to Britain’s UKIP and – of course – Donald Trump’s Republicans had shifted their parties to the left on some aspects of economic policy. Despite his tax and welfare policies, Trump was elected on a promise to revive manufacturing industry, and undertake a program of public works unmatched since the New Deal. This year has been different. The far-right candidate for the Austrian presidency lost (albeit by a whisker) to a Green. The Dutch right populist Geert Wilders and then the French Marine Le Pen failed more substantially. In French parliamentary elections last weekend, Le Pen’s party failed again. The British general election has to be seen in the context of this cheerful development. After the referendum, its architect, Prime Minister David Cameron, handed over leadership of his party to Home Secretary Theresa May, who quickly established a position that was essentially right-populist-lite: her firm commitment to Britain’s leaving the European Union and cutting immigration was tempered by vague but populist mood music on helping the working poor. By now, Labour was led by the veteran left-winger Jeremy Corbyn, politically close to Bernie Saunders but generally thought to be less charismatic. The general consensus that the combination of Corbyn’s far-left politics, his personality and his alleged history of support for organisations like the IRA and Hamas rendered him unelectable. Last summer, the vast majority of Corbyn’s parliamentary party passed a vote of no confidence in his leadership. Twenty points ahead of Corbyn in the polls, May decided to cash in her advantage and called a snap general election, announced in April. What she wanted – and the polls promised – was a Labour wipe-out and a dramatic increase in May’s majority, which would legitimize her leadership and enable her to be as aggressive as she liked in the negotiations to leave the EU. In addition to Labour’s polling woes, her strategists noted that the UK Independence Party’s vote had collapsed, with the expectation that almost all of it would break to the Conservatives. The hot money – and all but a handful of polls – predicted that Labour would lose between 20 to 30 of its disappointing 2015 tally of 232 seats. Even the bookies had the Conservatives odds on for a substantial overall majority. It is a triumph of British understatement to say it didn’t quite work out that way. What was confidently expected to be a Conservative gain of upwards of 50 seats (some polls suggested over 100) ended up as a net loss of 13 seats, and the conversion of a small but workable majority into a minority position (albeit with a lead of 56 seats over Labour). Labour increased its seat tally by 32, and its vote went up from 9.3m (30.4% of the total, 6.5% behind the Conservatives) to 12.8m (40%, only 2.4% behind). There were three reasons why Labour vastly exceeded expectations. One was that the Conservatives ran a strikingly incompetent campaign. An edgy performer at best, May refused to participate in television leadership debates, and had to rewrite her manifesto commitments within days of its issue. By contrast, Corbyn proved a sure-footed television campaigner (in interviews and debates), and attracted huge numbers of young enthusiasts at nationwide rallies. The second was that – again, against expectations – those young enthusiasts came out to vote. The earliest post-election poll estimated that 67% of 18-24 year olds voted Labour; a later poll assessed the youth turnout at 58% (both figures way above 2015). By contrast, 23% of 65+ voters backed Labour. The third was that the right-wing populist vote – the people who’d previously voted for UKIP, many in northern and midlands working-class constituencies (the British post-industrial rustbelt) did not overwhelmingly defect to the Conservatives, but split roughly half-and-half between the Conservatives and Labour. As with the Democrats, Labour did best in metropolitan areas with large student and higher-educated populations (places which had voted to remain in the EU last year). But a predicted rustbelt meltdown failed to materialise in the Midlands and Northern cities: all the seats in Birmingham (formerly centre of the auto industry) saw swings from Conservative to Labour. It was in smaller towns and industrial villages that the Conservatives improved their vote – though rarely well enough to overcome built-in Labour majorities. This third factor has the profoundest implications. Like other populist-right parties, UKIP has moved its economic platform to the left. Labour’s manifesto platform promised an end to student fees, but also free childcare, improvements in welfare and a program of state-led industrial investment. The fact that an unexpected proportion of UKIP’s voters moved to Labour implies not just that left economic programs are popular, but that UKIP’s left policies were a significant part of its appeal. In conjunction with the general retreat of the populist right in Europe, Labour’s success appears to be down to the economy, stupid. The collapse of UKIP is a good of itself: at its height, the party was gaining over a quarter of the vote in local and European elections (last Thursday, it was 1.8%). But it has also changed the political balance. In 2015, the combined conservative vote (the Conservatives and UKIP) was a (fairly narrow) 658,756 votes ahead of that of the progressive parties (Labour, the Liberal Democrats, the Welsh and Scottish nationalists, and the Greens). Last week the progressive vote exceeded the conservative vote by over two million. Now a confident Labour Party faces a Conservative minority government, forced to stitch up an alliance with the small Northern Ireland Democratic Unionist Party, a fundamentalist Protestant party, hostile to abortion and homosexuality, and suspicious of evolution and climate change. If that deal falls apart, another election will have to follow. Watch this space. *David Edgar is a playwright and commentator.